When camping and touring you need to decide whether you are going to tow something or not. 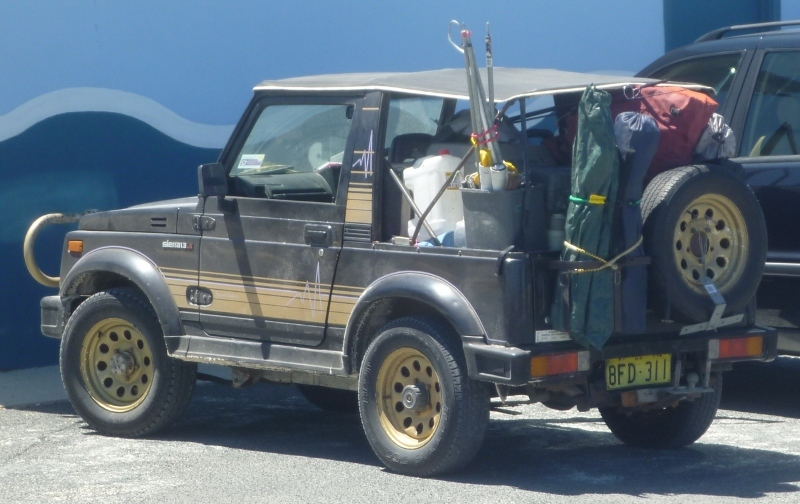 Most people travelling for lengthy periods end up towing something, from a normal trailer to a camper trailer to a caravan right up to huge fifth wheelers that are as big as an apartment. We are one of the few who decided not to tow anything – rare for those planning to travel for as long as we do. There are pros and cons to towing which are listed below to help you decide what you want to do. These are based on my own experience and opinions. This comparison is not motorhome vs caravan – that’s a different story altogether. For the sake of this article, a motorhome can be interpreted as towing. – Improved safety – if you aren’t towing you can stop faster, overtake in less time and swerve or change directions faster with less risk of losing control. 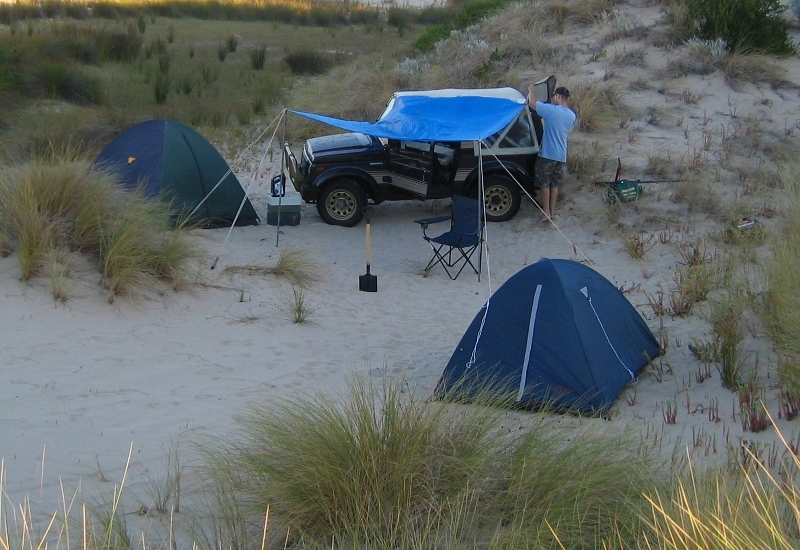 – Improved mobility – take narrow tracks without worrying about needing somewhere to turn around if you can no longer proceed, explore places that can’t be accessed whilst towing, get to more remote areas away from the crowds, park up quickly anywhere stress free without screaming at your spouse to vent frustration from the difficulty of backing up a caravan. I’ve pulled up and set up camp in less time than some towing folks have taken to back in. – Less risk whilst offroading – less chance of breaking something, less chance of getting stuck, and if you do get stuck there’s a greater chance you will be able to extract yourself. – Spend less time fixing stuff. Caravans and camper trailers often suffer from various issues such as water leaking, dust ingress, wheel bearing failures, suspension failures, door handles falling off, etc. For some reason, for an item less complicated than a vehicle, they suffer from more problems. Probably because they are not massed produced on the same scale, are highly customized and therefore do not get the benefit of mass produced production line quality control. – Less wear on your vehicle – towing a large load is pretty hard on your vehicle. When towing expect more frequent and costly servicing and less life out of drivetrain components. -Spend less time and money on tyres. Tow offroad and the risk of tyre damage is much greater. The tow ball load may only be a couple of hundred kilograms, but in dynamic conditions, say hitting a bump at speed, this could translate to a huge force. The rear tyres of towing vehicles take a battering when offroad. – Lower capital cost – camper trailers and caravans are expensive. – Improved fuel efficiency – towing significantly increases fuel consumption. Depending on what you are towing and how fast you go, typical extra fuel usage may be around 40% or much more for very large loads, which adds up to a lot of beer funds when travelling long distances. – Less impact on the environment – consume less resources, release less carbon. – Learn to live simply and efficiently and gain an appreciation for living that way. – Less compromise on comfort – live more like you’re at home, have a homely space to relax and live in. – Less compromise on space – if you don’t tow you will be leaving things behind that you’d otherwise want to take. The stuff you do take will likely be jam packed into your car and time consuming to access and repack. – Enables you to tolerate travel for longer – you might get sick of roughing it. – Escape bad weather. If you don’t tow and it’s raining you’ll get sick of being confined to a small area and being unable to access your stuff in the car or take a leak without exposing yourself to the weather. – Escape the bugs – mozzies and midgies can reach plague proportions in some areas. Try preparing dinner outdoors whilst getting eaten alive by mozzies. If you’re not going to tow you need to think about storage solutions to get the best out of the space you have. Consider things like drawer systems, slide out shelves, stackable tubs, roof racks, roof platforms, long range fuel tanks (do away with jerry cans) etc. Also consider what equipment you will take – items that use space efficiently like nesting cooking pans, or multi-purpose equipment that can replace more than one item. For example a good smartphone and laptop can allow you to do away with a GPS, mp3 player, TV, stereo, DVD player, DVDs and CDs, books and maps. A good set of trackie pants can be used for fishing and for going out for dinner, allowing you to leave behind your formal trousers. A good bushcraft spatula means you can leave behind bottle openers, hand trowels, paint scrapers, bellows, fire stoker and bbq utensils. And a thermomix can do the job of many appliances (at great expense). My camping experience was garnered with a Suzuki Sierra – with such a small car you learn fast how to go camping without much stuff. We’d go for a week long camping trip, myself and two others and all our gear crammed into the car like tetris. We called the area in the back the safety cell, because the person sitting there was surrounded by camping stuff stacked up to the roof from all sides. I enjoy camping simply and efficiently and achieving the same results as others whilst using less resources and equipment to achieve it. I also am very conscious of opportunity cost – for example how much extra camping will a year’s worth of fuel savings by not towing get me. I also want to go places where you can’t go whilst towing. 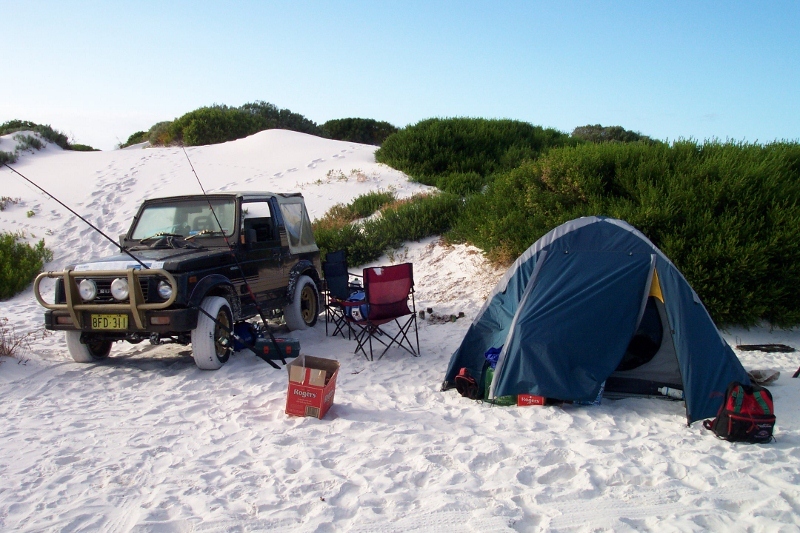 Boggy beaches is a common one – I love cruising along beaches, pulling up somewhere for some fishing, a few drinks and a beach side bbq cookup. Some hard pack beaches you can tow on, especially if there are others around that can help out if you get into trouble. 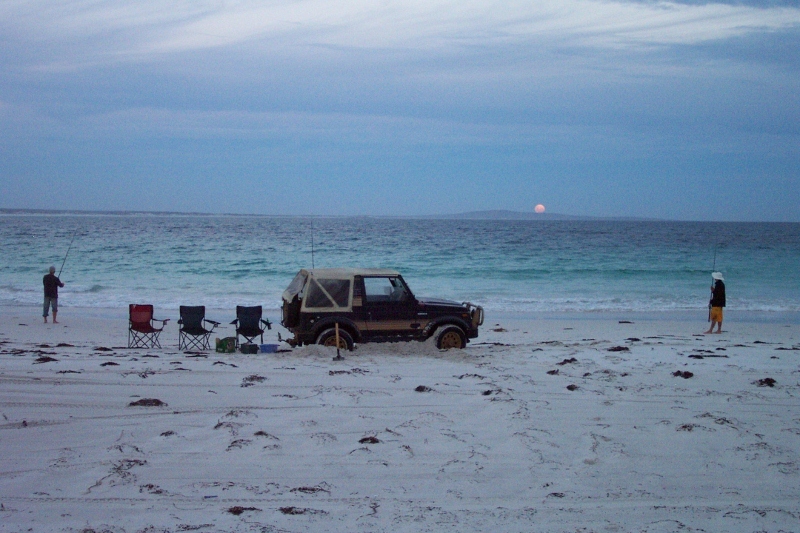 If you’re by yourself on a remote, boggy, sloping beach, it’s way too risky to try whilst towing. So for me I decided not to tow. Even without towing, I still need to be careful on the beach. 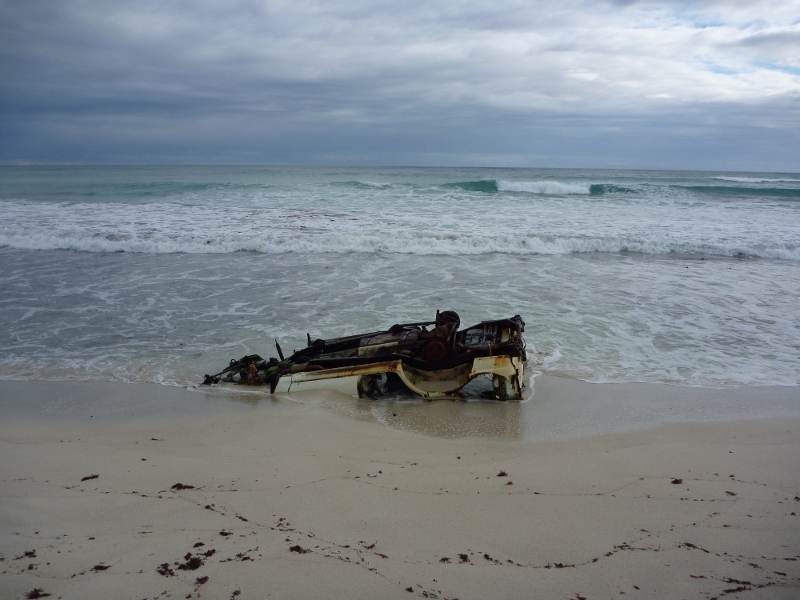 Many four wheel drives have met their grave bogged on a beach on a rising tide. I don’t want to be the next one!